Please Note: The commenting period has now closed. Please check the AAVS Action Center for other opportunities to take action for animals. What do squirrel monkeys, marmosets, and macaques have in common? Unfortunately, they are three of the most commonly used primate species in research. They are social, intelligent animals, which is evident when observing them in the wild. Laboratories, however, deprive them of a natural environment and essential needs, especially companionship. That’s why we’re asking you to support a petition that calls for living environments in labs that allow expression of natural primate behavior. The most important aspect of primate life is group living. In fact, it is so important that many primates will choose companionship over food. Group living can also promote essential natural behaviors like grooming, playing, and foraging. AAVS opposes the use of animals in research and we will continue to work every day until there are no monkeys or other animals in labs. But for those tens of thousands who are there today, it is unconscionable to have so many exist in constant psychological distress and despair because they live in isolation and barren environments. 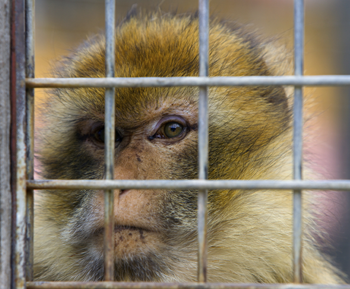 The Animal Welfare Act requires facilities to have an enrichment program that will “promote the psychological well-being of nonhuman primates.” But the existing guidelines are vague, and USDA inspectors admit that they are difficult to enforce. Primates in labs need all of us to speak on their behalf. Please voice your support for this petition, which asks for meaningful standards to provide some measure of primate well-being in labs. Comments are due on or before August 31st. In the comment box, express your support for this petition. You may copy and paste AAVS’s sample letter below or, preferably, personalize your comments. I am writing in support of the petition requesting better living environments for primates in labs that will allow them to express their natural primate behavior. The primate species most used in laboratories are social, intelligent animals. Companionship is very important to them, and essential to their psychological well-being, so primates living in isolation and barren environments suffer immensely. The Animal Welfare Act does require USDA to ensure minimum standards for “a physical environment adequate to promote the psychological well-being of nonhuman primates.” However the current regulations are not specific enough, making it difficult for the law to be enforced. There are different ways to provide appropriate environments for primates, but they must meet the needs of individual animals or they are meaningless and token efforts. Naturalized primate environments require social housing, access to outdoors, varied foraging opportunities and challenges, space and opportunity to climb and build nests, and allowance for individual choice and self-determination. The suffering of primates in laboratories is well documented and meaningful standards are urgently needed and what USDA needs to do. Under the comment box, you will be asked to provide your contact information. Click the blue “Continue” button.